When you notice germination and seedlings beginning to grow, remove the plastic dome or plastic bag over your planting trays. Check daily for moisture, but avoid the temptation to over-water. Soggy soil, excess warmth and poor air circulation can lead to damping off, a common fungal disease that can kill baby plants. Prevention goes a long way, and you can use a fungicide called No Damp to help combat this. Most young plants grow best at day-time temperatures between 70 to 75ºF (21º to 24ºC) and night-time temperatures between 55 to 65ºF (13º to 18ºC). 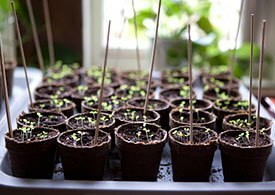 For healthy, bushy growth, tiny sprouts need plenty of light, and they’re more likely to get it under fluorescent lights than on a windowsill. You don’t have to use expensive grow lights: ordinary cool-white 40-watt fluorescent tubes do nicely, as the young plants will only need to grow under them for a few weeks. Shop lights that hang from chains on a light stand are ideal. 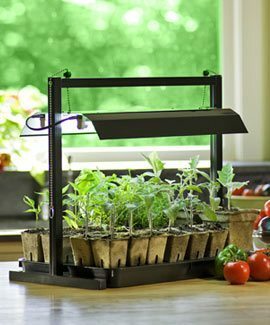 The chains allow you to adjust the lights to keep them right above the seedlings. The importance of light: Keep plants as close to your lights as possible: This helps prevent plants from growing weak, spindly stems from stretching too. Set your lights on an automatic timer set to be on for 18 hours and off for six hours. When to start giving fertilizer: When your baby plants have two sets of true leaves (the first leaves are called cotyledons or seed leaves), start fertilizing once a week with half-strength liquid plant starter or fish emulsion fertilizer. Transplanting: If necessary, transplant seedlings into their final pot once they have their second set of leaves. 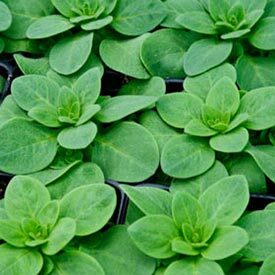 Always handle young plants by the leaves, as the roots and stems are very tender. To do this, set your plants outside in a shady, sheltered spot for at least a week or two before transplanting into the garden. Give your plants half a day outdoors at first, and gradually leave them out longer, slowly moving them into sunnier and windier areas to get them used to life in the real world. Once they’re outside for good, protect them by covering them on cooler nights with a sheet or putting them into a closed cold frame. Cool-season annuals such as pansies and snapdragons should be hardened off several weeks before tender, heat-loving ones such asimpatiens or tomatoes.